Quora has plenty to learn from Y Combinator but it’s not giving up the traditional 7% equity share to join the accelerator. 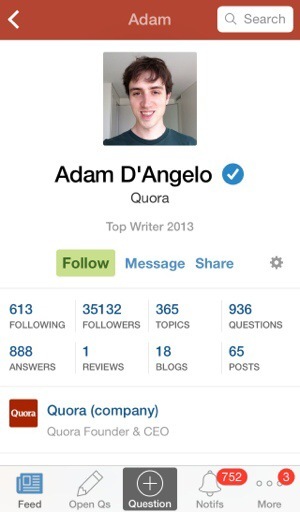 Quora CEO Adam D’Angelo tells me “YC invested an amount that was similar to their standard $120k. They invested as part of the Tiger round.” That $80 million round valued Quora at $900 million, so the startup only traded away approximately 0.013%. We’ll have Sam and all the other partners to help us. That alumni network could prove fruitful to Quora, as it might provide a leg up when courting failed YC startups to become talent acquisitions. What Could Quora Learn From YC? Wikipedia is a household name. Quora is not. Y Combinator’s growth scientists could help it bridge the gap. Quora has been cagey about its stats since forever, only talking in relative growth and vanity metrics rather than absolute user counts. For example, Quora says it grew 3X in all metrics from May 2012 to May 2013, and hit 500,000 topics in April 2014. This makes it tough to know exactly how popular it is, but the general consensus hovers around “known amongst Silicon Valley intellectuals” and “just not big enough”. Quora exec Marc Bodnick did tell me last month that public measurement services “significantly underestimate” Quora, and “are off by a factor of 5X to 15X.” An average of (sometimes inaccurate) comScore and Compete numbers for February multiplied out would put Quora somewhere between Quora’s web traffic could be somewhere between 5.5 million and 16.5 million monthly users, plus the 40 percent of its users it’s said are on mobile. That doesn’t seem too shabby, except Quora mission “To grow and share the world’s knowledge” targets everyone, yet it’s far from ubiquitous. Plus, Quora was founded by well-regarded Facebook execs and has $141 million in funding including an $80 million Series C raised last month . As we’ve seen with Twitter’s battered share price, investors are demanding total user growth. Monetization potential aside, it’s having enough people to push that business to that matters right now. It’s quite possible that Quora touts its other stats because it has highly engaged users reading, writing, and answering but just not enough of them to look impressive in a world where Facebook has 1.28 billion users. Meanwhile, Quora needs to find some way to make money, as D’Angelo told me last month that me “We specifically want to stay independent for the long-term.” Without acquisition potential to rescue it, Quora must climb monetization mountain. YC specializes in helping young startups craft a compelling service with product-market fit that can grow rapidly and get somebody to pay for it. While Quora’s subject question-and-answer service provides a ton of value if you dig into it, it’s not as intuitive and familiar as object knowledge bases like Wikipedia that piggyback off the classic Encyclopedia style. Quora has come a long way with the addition of full-text search, but it hasn’t found the secret sauce to convince the average person its app is essential resource to frequently check. The guidance from YC’s expert partners, and the rigors of the program could help whip Quora into shape. How Does This Change YC? Even though YC is getting a much smaller cut of Quora, the deal makes plenty of sense. The YC President’s post about Quora joining in is quite vague, but a source tells us “Altman wants a piece of every billion dollar co, every unicorn.” Quora only needs to grow a little more to join the billion dollar valuation club. While typically YC has to bet on baby startups with a high likelihood of failure, Quora has already had a degree of success. Plus, many believe the subjective knowledge space is sure to be important in the long-run, and Quora is far and away the front-runner. A quick tour of the nonsense and trolling on Yahoo Answers confirms that. Altman calls the arrangement with Quora an experiment, and a source tells me it won’t be YC’s only one. The incubator is also said to be admitting some very slow-burn startups working on hard technical problems over the long-term. That’s different than the fast-to-market startups YC is more accustomed to. With the international expansion of its Startup School event and this next batch being one of its biggest, YC is attempting to scale up without diluting its value-add. Now as it reaches to encompass a wider range of late-stage and hard-tech startups in its 10-week regimen, it will also have the challenge of scaling sideways.